I made it to Easter! Contrary to how I felt, say, around the Third Sunday in Lent, my prayer, fasting and almsgiving did not in fact kill me. And yes, I did hear that many did not succeed for the entire Lenten season, but I made it anyway. O, it feels so good. Is it just me, or has it become much more painful and difficult to keep Lent these days? There is so much more in our daily lives today, more work, more fun, so much beauty, so much food, so many friends, inundated technology, that keeping a fast from any of it seems much more restrictive than it did in my youth. But fast I did, in my weak and little way. I certainly don't deserve Easter, but, I thank God. Yet, despite all of my temptations, Easter has finally arrived. Now, I feel compelled to announce to those around me the message of joy and hope because Jesus who was crucified, is raised. The tomb does not have the last word, Life does! Look to the empty tomb. You will see the Resurrection! On this glorious day, look at the experiences and events of the past weeks. Thank God! For the good and the bad. It has been a journey of reflection and prayer through this Lent. 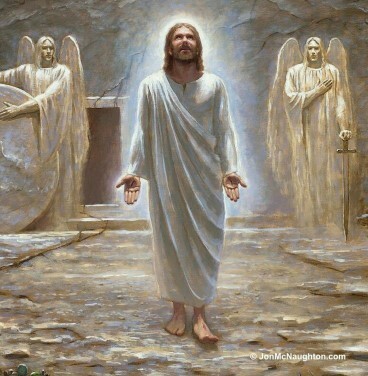 Now, Easter is a time to enter into the joy of the Resurrection. I ask you to reflect on your Lent. What did you accomplish? What is left undone? Leave both at the altar. And praise God for the gift of new life! My next challenge and question is: "How will I keep the Easter feast during the next fifty days of the Easter season?"